They offer a new challenge every Tuesday and their new challenge is Nature or Fall Colors. How can you not love that. Those are my favorite colors and my favorite time of year. Of course, I live in Texas and the weather is not very cooperative. We've been at least 15 degrees above normal. Made for an easy Halloween for the little ones though. To make the drape I cut a 3" strip of the paper of my choice. I cut off 1/2" of the 12" side. On my cutting tool, I placed the paper long ways at the 3" mark and using the scoring tool, I made the first score. I then continued to score at 4'', 6", 7", 9", 10". I secured the folds with my bone folder and tape runner. 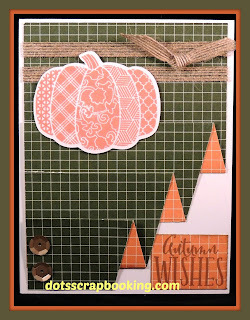 The Pumpkin was cut at 2" using the Artbooking Cricut cartridge and stamped with the Autumn Wishes stamp. I'm excited about sending the cards to my family! The value pack of cards is $14.95 not including tax and shipping. With 50 each cards and envelopes making the cards is so inexpensive, ~$0.30, compared to the $6 cards I've seen. What a fun card! Love how you did the right bottom corner. Thank you for inspiring us at Between The Folds Bi-Weekly Challenge Blog. I love so many things about this card! This folding technique is especially effective with this your choice of fundamental patterned paper, the textured ribbon is the perfect touch, and that pumpkin stamp is one of my favorite autumn stamps. Thanks for sharing with us this week at Between The Folds. Love it! The folding is great with this and the ribbon is the perfect touch! Thanks for playing along with Between the Folds (BTF)!